Schools have a responsibility to lead the way when it comes to sustainability, teaching the younger generation to grow up to become responsible adults. Alongside saving the planet, effective risk management and reduced environmental impairment can result in lower insurance premiums for your school. Insurance brokers such as Bluefin Groupspecialise in providing insurance and risk management advice to the education sector, so speak to the experts and see how improving your carbon footprint could also improve your bank balance! There’s no way around it; congestion costs the UK economy £5 billion a year in productivity but it is estimated that there are up to 10 million empty seats available for sharing every single day. Up to 90% of pollution in major cities is caused by road traffic and yet the thought of sharing a car with a stranger is a possibility that many would never entertain. Congestion caused by school runs could easily be a thing of the past if parents would engage with other local parents and encourage lift sharing. School-carshare.co.uk (formally the UK’s only dedicated school lift share solution) may have closed down, but it was not our only hope to reduce carbon emissions, pollution and congestion on the school run. There is still a number of hugely popular car sharing websites available with the majority of routes on offer being school and work runs. While not all parents have the time or money to be strictly eco-conscious, remember that sharing school runs with other families can save a considerable amount of money and can free up several mornings and afternoons per week for time-strapped parents. We don’t need apps or the internet to find ways to reduce our carbon emissions. We all know that walking is one of the simplest solutions to helping the environment but if you feel like you need some help from the World Wide Web to convince parents of this then point them to a brilliant initiative called Walk To School. Having now reached over 13 million people, Walk To School claims to be one of the UK’s biggest behavioural change campaigns. The initiative runs national events such as WOW (Walk Once a Week), Walk To School Week and International Walk to School Month. These schemes aren’t just designed to get lazy teenagers to give up free lifts from their parents; they are also aimed at primary school pupils and parents themselves. Many parents have reported back that making a change and walking to school with their children has greatly improved their parent/child relationship, as children are more likely to engage in conversation about their school lives whilst walking to or from school. It is also a great source of exercise for parents and children alike, as well as hugely reducing your carbon footprint. The war on litter has been raging ever since the Keep Britain Tidy campaign launched in the 1950s. Litter and its effects are the easiest environmental concept for children to grasp, and ways of tackling our litter problem have been taught in schools for decades. No teachers or children like their school to look like dumpsite and, while tidying up may be a chore, schools have never had any problem teaching children the parallels between a space that is nice to inhabit and cleanliness. Unlike our 1950s predecessors, we now know that harnessing the man/child-power of the classroom for a litter pick up afternoon (where everything is thrown into black bin liners and transported straight into landfill) is no longer good enough. Litter and recycling should now go hand in hand and there are a number of agencies that can help your school be proactive in tackling litter and its effects on the environment. Also Eco-schools.org.uk has some great sections and advice on how to get involved in a number of local recycling/clean up schemes. Food waste is an issue facing the whole of British society but it is at school where we all had our first real taste of public dining and the food service industry. These impressions stay with us for life and in many cases develop bad eating habits and practices from a young age. We all remember the readily available, cheap, poorly prepared, nutritionless slop that was served to us at school in giant troughs that were as easily thrown away as they were prepared. Jamie Oliver’s Feed Me Better campaign may have had a good go at trying to educate children and teachers about the benefits of healthier eating in schools, but if children could see first-hand how much of this food is wasted each day and the sort of implications that this has for the planet (accumulated across 25,000 schools in the UK), then perhaps we could nip some of these wasteful habits in the bud at a young age. It is estimated that UK schools throw away up to 123,000 tonnes of food a year, most of which go to landfill. Schools are in a unique position to set a perfect example to children of how we should deal with food waste, but they also find themselves in the unique position of having one of the worst records of dealing with wasted food across all work sectors. A number of schools across the UK are already engaging in eco-schemes with companies like Andigestion.co.uk, who enable schools to send in their food waste for processing at their anaerobic digester plants. At these plants the food waste is processed into biomethane gas and a liquid fertiliser. The gas is then pumped into the National Gas Grid creating renewable energy and the fertiliser is distributed among local farms helping the community. You could also get involved with companies such as Schoolfoodmatters.com or the Childrensfoodtrust.org.uk, who both have a number of schemes to help educate and innovate when it comes to cooking and food waste management in schools.Foodforlife.org.uk also has a range of information available to parents, teachers and local authorities. 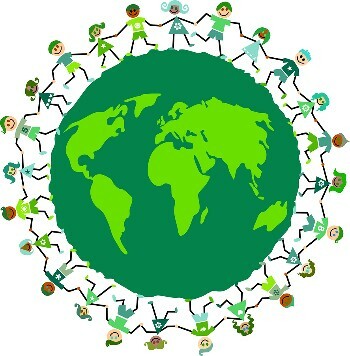 It’s easy for common sense eco-tips to be lost among the many rules that school children are bombarded with every day. The majority of children have no comprehension of why they are being asked to follow certain instructions and important practices like turning off unused taps can become yet another “stupid rule” to rebel against like keeping your top button done up. That’s where the curriculum can come in. Carbon emissions, recycling, deforestation, the ozone layer and global warming can all be slotted seamlessly into the curriculum through science, maths and geography. Topics like climate change can appear to be largely absent from the current national curriculum, as the science behind global warming is still fiercely debated, but this doesn’t mean that you can’t teach it. The facts around climate change are there to be seen and the facts all indicate that the global climate is dramatically changing. This isn’t debated, what scientists can’t agree on is the cause of this change. The devastating effects of climate change are there to be taught and there is no reason why teaching needs to become preaching in the class room. Just present the facts. Getting children to really engage with how humans affect our own environment and understand how tiny individual actions can accumulate into worldwide problems isn’t just a good route to an eco-friendly school but it’s also the only chance that we have of an eco-friendly future.